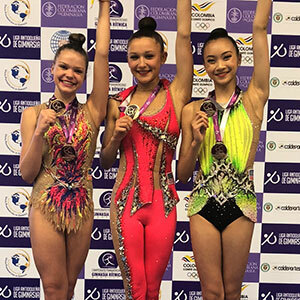 MEDELLIN, Colombia, May 7, 2018 - Shannon Xiao of Fairfax, Va./Gymnastics World, and the U.S. junior rhythmic individual team won the all-around and team gold medals this weekend at the Junior Pan American Championships for rhythmic gymnastics in Medellin, Colombia. In the team competition, Elizabeth Kapitonova of Staten Island, N.Y./Isadora, and Matylda Marszalek, Highland Park, Ill./North Shore Rhythmic Gymnastics Center, joined Xiao to win the gold medal. They tallied 144.600 well ahead of Canada’s 131.250. Brazil earned a 121.950 for the bronze. Xiao was the all-around champion, earning sores of 14.950, hoop; 15.050, ball; 15.400, clubs; and 14.450, ribbon. Her 59.850 earned the U.S. a spot in the rhythmic gymnastics competition at this year’s Youth Olympic Games. Canada’s Natalie Garcia won the silver medal with a 59.400 total in the all-around, while Kapitonova, who earned individual event scores of 15.450, hoop; 13.850, ball; 15.200, clubs; and 14.200, ribbon, posted a 58.700 all-around total for bronze. Marszalek finished fourth after totaling 49.600 in the all-around. In the apparatus finals, Xiao and Kapitonova won eight medals. Xiao was the champion in hoop with a 16.400, followed by Kapitonova in second at 15.950. Garcia won the bronze with a 14.500. Kapitonova took the gold medal in the ball final, scoring 15.050. Garcia (14.600) won the silver with Xiao earning bronze (14.350). Garcia took the top spot in the clubs final, just ahead of Xiao, 15.750 to 15.500. Kapitonova earned a 15.000 for bronze. Kapitonova added another gold medal for Team USA in the ribbon final with a 14.750. Xiao finished second with a 13.950. Mexico’s Xitlati Santana earned a 12.550 for bronze. In group competition, the U.S. finished third with a two-routine score of 19.200. The U.S. junior group consists of Anastasiya Ivanova, June Kim, Alexandra Militeeva, Valerie Militeeva, Vianna Ngo, and Ellen Peng, all of San Diego Calif./Emerald City Academy of Rhythmic Gymnastics. Chile (25.750) was the all-around champion, followed by Brazil (24.400). The group added two silver medals in the event finals. In the five rope competition, Chile was again golden, earning a 13.550. The USA was second with a 12.800, followed by Brazil’s 11.400. Brazil took the gold medal in the 10 clubs final, earning 13.350. The U.S. was right behind in second with a 13.250. Chile posted a 12.400 for bronze.